Blog | Get Off My Podcast! Trent and I love Harrison Ford. Always have. Ever since Star Wars – like most scruffy lookin’ nerf-hearding scoundrels. Since then, most of Harrison’s movie releases have become like events to us. So, why not do a podcast about the man? Yes. Why. Not!? 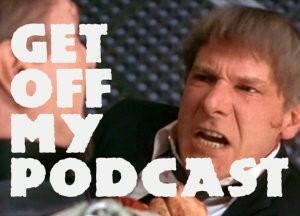 Coming soon, a biweekly podcast about Harrison Ford called “Get Off My Podcast!” … cause, you know, his Air Force One quote and stuff. Look for it in the coming weeks as we release a couple episodes close together. Thanks!